MoMileSplit is on-site in Jefferson City for the 2014 Class 3-4 State Championship Track and Field Meet. 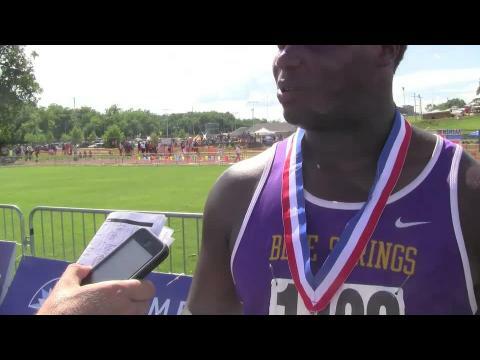 Blue Springs dethroned Hazelwood Central as the boys champions of Class 4 at the state meet, and the Wildcats did it by scoring all over the track. It took 25 years to topple Megan Thompson’s 1,600-meter record. It took less than 10 minutes for that mark to fall again. The deepest preview you will find for any state meet - the Missouri Milesplit Class 3 and 4 State Meet preview. We preview EVERY event for the weekend. Hazelwood Central put the field on notice right from the gun that it meant business in the 3,200-meter relay Friday at Lincoln University’s Dwight T. Reed Stadium. There was so much anticipation for something special to happen that even Governor Jay Nixon made an appearance to watch Carlos and Khalil Davis throw the discus. In all, there were 13 record-setting performances at the MSHSAA Class 3-4 Track & Field Championships at Lincoln University’s Dwight T. Reed Stadium. McCluer North will surely find a place of prominence for the 2014 Class 4 girls state track championship plaque. CJ Jones has been targeting that state 800-meter run record for years, and it continued to elude him at his final MSHSAA championship meet. The Grandview girls joined their boys team atop the Class 3 podium at the state meet Saturday after racking up 63 points. Hannah Long simply owned the Class 4 distance races. Glendale’s Spencer Haik knew there wasn’t a next year for him, as he closed out his high school career with his third 1,600-meter title in the seventh fastest time in state history at 4:09.41. The Class 3 boys team race turned into a contrast of the familiar against the newcomer, and in the end they found themselves locked in a tie atop the state standings. The winds at Dwight T. Reed Stadium picked up slightly in the afternoon, and they played havoc with the plan Spencer Haik and Stephen Mugeche had set for the Class 4 3,200-meter run. Ste. Genevieve sophomore Taylor Werner finished re-writing the record books – for now. Craig Martin interviews the winners of the Friday's field events. Our team is back on-site for another exciting day at the MSHSAA Class 3-4 State Track and Field Championships. Cardinal Ritter senior CJ Jones is known for his 800 meters. This year he added the 400-meter run for the first time since his freshman season, and he let it be known that he was targeting the 2003 record of 46.81 held by Jefferson City’s Domenik Peterson during Friday’s prelims at the Class 3-4 MSHSAA Track & Field Championships at Lincoln University.